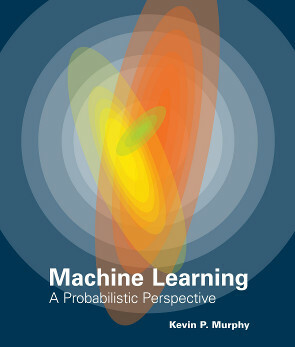 I spent a lot of last year, getting excited about data science and machine learning. On the way, but Amazon needs 11 days to deliver it, so it’s not on the shelf ready yet. I recently attended the Strata Conference in London. This is the latest incarnation of O’Reilly’s Data conferences. There was a palpable sense of excitement in the air. Obviously most of the attendees were already ‘data’ aficionados, but it’s clear that ‘data’ in various forms is on the radar for governments, large corporations and the developer communities. If you asked anyone when ‘big data’ started to become important most people would say they started to hear about it, maybe 5 years ago. George Dyson blew that idea away in his keynote talk which talked about various data projects as far back as the 1950’s. He told us a great, easy to remember stat - In 1953, the total amount of RAM in existence worldwide was just 53kb. Having said that it’s still early days for most companies looking to leverage their data. A few of the speakers mentioned that some companies are saying We’ve got all this data, what can we do with it? The consensus was that this isn’t the right approach, rather find a problem that you need to solve, then look at the data . It’s also true that a lot of really interesting, important and relevant questions can be answered with datasets that fit on a laptop. It’s not always about tackling problems at Google scale, we should be focusing on the important data instead. All sorts of changes in society are coming when we start measuring and analysing more and better than we do today. Some of those changes are going to be difficult from a morality and privacy point of view, but I’m confident that by using data well we’ll have opportunity to improve many areas. Last night I gave a brief talk about Clojure’s STM to the London Clojure User Group. In my previous post, Clojure STM - What? Why? How? I gave a high level run through of Software Transactional Memory in clojure via Multiversion concurrency control. The first example demonstrated how a transfer between two bank accounts could be achieved transactionally. A second example talked about a report over all the bank accounts in the system, whilst transactions like those in the first example were proceeding. The key point to notice here that the current value of each account is retrieved via the deref in the call (map deref accounts). This makes the current value of the ref the in-transaction value for the remainder of the transaction. Since there is a call to deref for each account and traversing the list takes finite time (especially since map returns a lazy sequence) is there a potential for a change to a value in the accounts collection while we’re traversing the list? A function that takes a ref and increments it after a given delay. A function that derefs a given ref, delays a given amount then derefs a different ref. 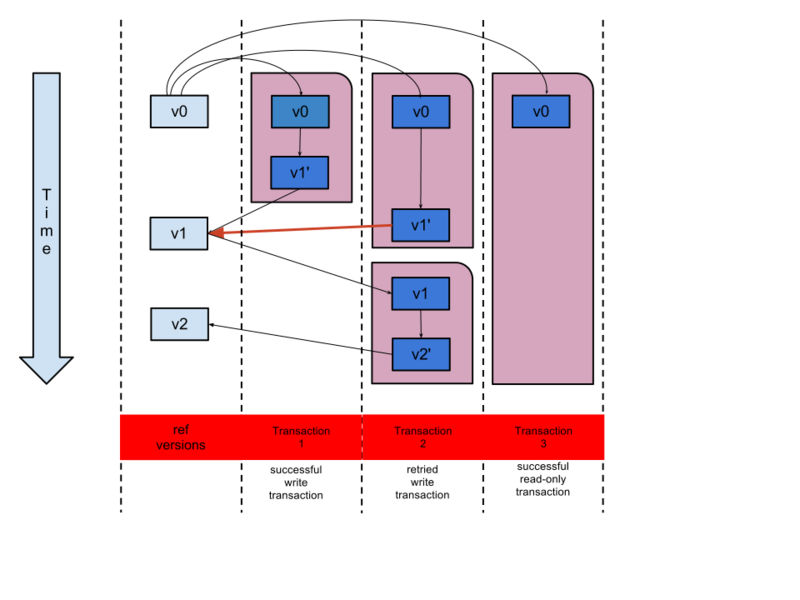 Given these two methods we can engineer a situation where we (deref ref2) in one transaction, update ref1 a few times in other transactions, then (deref ref1) in the first transaction. If the assertion about a consistent snapshot is correct then the updates to ref1 shouldn’t be visible in our first transaction. So what happens when we run this? The r1=3 result is not what we’re expecting. If the read of ref2 creates a ‘read point’ that all other refs are aligned with, the updates to ref1 should not be visible here. Also we see that the READ transaction is unexpectedly re-starting. Remember that the ‘READ’ transaction here is read-only. It seems that clojure has something of an inconsistency here. When the ‘READ’ transaction is complete, the runtime looks for an entry in the history of all the refs from before the transaction started. If it finds an entry then the transaction completes, otherwise the transaction is aborted and retried. In this case this means that it (incorrectly in my opinion)picks up the latest version of ref1 and completes, returning r1=3. So it seems that the concerns raised on reddit were valid, because clojure doesn’t strictly follow the behaviour described in the documentation. In this case this means that the transaction picks up the latest version of ref1 and completes, returning r1=3. This is a ‘correct’/consistent result, but the system has done unnecessary work. Although this works, and would apply to our original model for accounts, I don’t really like it. There’s a better way to model this; Rather than make each account a ref in it’s own right, store the collection of accounts under a single ref and update the whole collection for each transfer. 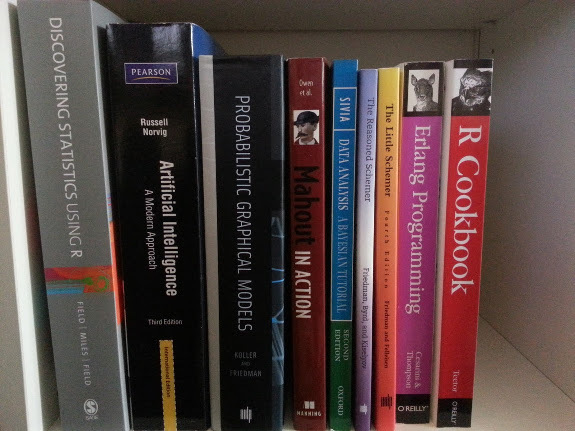 to      => index into accounts collection for to account"
In this post we’ve investigated consistency between refs, found a potential problem with the clojure runtime and eventually improved out model to avoid the problem. In the next post we’ll discuss a subtle requirement when dealing with refs. Namely - How do you ensure that a ref hasn’t changed during a transaction? The answer is pretty sweet in java. I wondered what it might look like in clojure…. Actually surprisingly similar. The difference is that the clojure code looks familiar whereas the java code looks quite optimized. Simply put in clojure you will tend to write short meaningful code, whereas in java you will have to work hard at it….